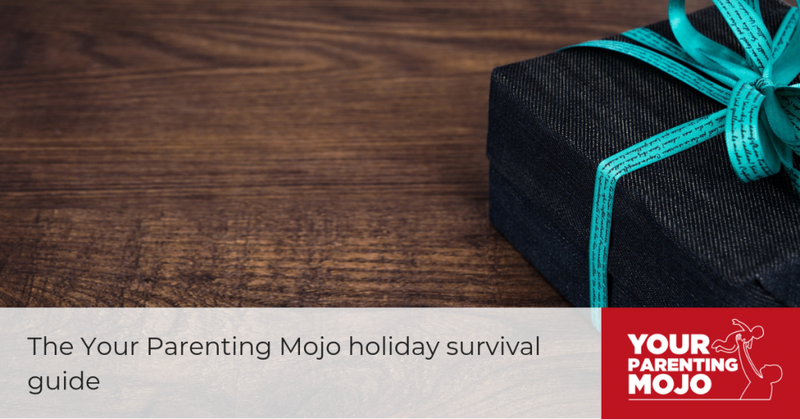 The Your Parenting Mojo holiday survival guide! We want to enjoy them, but sometimes we just have to get through them. Here are some ideas to help you spend less time getting through, and more time enjoying. Carefully consider where you’ll stay. If your parents’ house has paper-thin walls, small rooms, and little extra space, then as much as you love your parents, it might not be a great fit for your introverted, noise-sensitive toddler. Perhaps your family can clear some space in an unused room to create a retreat for your child, but if you end up in there as well for half of the holiday then you may be less than happy. It might end up being better for everyone if you stayed somewhere close by and visited your parents for a few hours each day rather than being constantly in each other’s space, particularly if your relationship is less-than-perfect. Talk with your family about reasonable expectations for your child’s behavior. Given the stresses of being around unfamiliar people in an unfamiliar environment, opportunities are ripe for big emotions (aka ‘tantrums’). If your family will respond to your child with “Oh come on; big boys don’t cry” or “I don’t want to hear any more of that noise!” or “If you stop crying, I’ll give you a candy,” set expectations before you arrive of what behavior your family is likely to see and what you’ve found to be helpful to do in response (aka what you would like them to do in response). Consider any hard boundaries that you will not have crossed, and let your family know about these in advance as well. These topics might include comments about anyone’s weight, or racist comments, or anything-but-supportive comments about your child’s shifting gender identity. Be clear in your own mind about what you will do if these boundaries are crossed, and then don’t be afraid to do that thing if it happens. Let family members know about any strong preferences (that don’t quite meet the ‘hard boundary’ threshold) that you would prefer to have honored. These examples might include not offering soda to your child, offering nutritious foods before junk food, or not having the TV on in the background aaaaaalllllllllll day. Explain your reasons for these preferences and discuss – in advance – whether your family members are willing to work with you at least some of the time (perhaps you could agree to have the TV off one day and on another day, to catch one important football game rather than all of them). Be open to ideas that could meet your needs as well as meet your family member’s needs. Protect your child where necessary. If they’re expressing big emotions and Grandpa is being vocal about not wanting to hear them, remove your child to a quiet space. If Grandma insists on a hug and your child doesn’t want one, step in and say “perhaps [child] will be ready for a hug later!”. If it’s clear that your child is getting overwhelmed, don’t force them to stay at the dinner table because your family expects it. You’re not ‘setting the stage for bad habits;’ you’re setting your child up for success in the current situation – and it’ll only be for a few days. Know when to let go. Your parents might not interact with your child in exactly the way you would wish, but they will have their own relationship and (for the most part) that relationship is likely to be fine. If you’re taking an hour for yourself, you hear your child screaming upstairs at their sibling, and your spouse is close by – let your spouse handle it. They won’t do it in exactly the same way that you would, but it will end up fine. Your family isn’t perfect (and – surprise! – neither are you). It’s OK if not everyone has perfect interactions with your child – children are resilient, and they will know that you are still their parent and how you interact with them is the most important thing in the end. Appreciate what your family DOES bring to your child. Whether it’s exposure to different viewpoints to family history to just knowing that Grandma and Grandpa care about them, your child gets something positive out of the holiday experience, even if it’s stressful for you. Keep your eyes on the prize, and appreciate the value that your family brings to your child, through your child’s eyes.